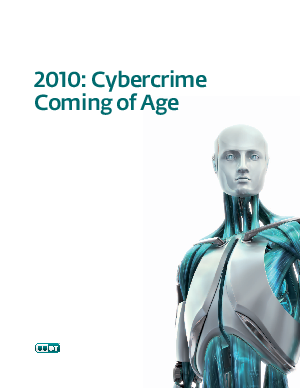 As you will have guessed from the title, we believe that cybercrime is very much the "shape of things to come". ESET Latin America's document forecasts the continuing shift of the most malware attacks to the Internet. The team also predicted that during 2010, crimeware 1 will be the most commonly used attack vector. The cyberattackers' inclination to make money from their activities has found a natural ally in the criminal underworld. For this reason we expect to see a clear upward trend in malicious code created with profitability in mind. Cybercrime is on the rise, not only in terms of the number of perpetrators and the volume of crimes committed, but also of the range of techniques employed to carry them out. In this environment, malicious code offers a valuable resource for those wishing to perform attacks through the Internet and information technology.